Poker Chip 831, under jockey Cody Jensen, fights to his second win in as many starts in the Texas Classic Futurity trials at Lone Star Park. GRAND PRAIRIE, TX� OCTOBER 26, 2014�Katsy and Monte Cluck's FANTASTIC CORONA JR 2-year-old POKER CHIP 831 remained undefeated in two starts Saturday night while posting the 11th fastest time in the Grade 1 Texas Classic Futurity trials at Lone Star Park. POKER CHIP 831 will be the first invite for the $69,771 Texas Classic Juvenile Invitational to run November 8th on Lone Star Park's closing night for the 2014 Meeting of Champions. The gelding entered the Texas Classic trials off his maiden victory in his first start in the Rainbow Futurity(G1) trials at Ruidoso Downs on July 3. Saddled by C. Dwayne Gilbreath and ridden by AQHA Racing Champion jockey Cody Jensen, Poker Chip 831 was bumped from both sides at the start but recovered to defeat Politically Correct by a head. 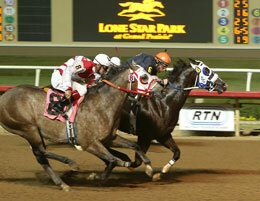 His time of :19.750, a 90 speed index, missed the Grade 1 $860,519 Texas Classic Futurity by only 10/100ths. Burnett Ranches, LLC bred Poker Chip 831 in Texas from the multiple stakes producing First Down Dash mare Takeoff Royally. The Cluck's purchased POKER CHIP 831 (previously name Terrific Takeoff) for $47,000 at the 2012 TQHA Sale.